These Pothos Plant Benefits are science-backed and confirmed in various studies. And, don’t forget, it’s a low care houseplant that can grow without sunlight! Pothos is a tropical vine, which is commonly grown as a houseplant. It’s widely grown indoors for ornamental purposes and due to its low maintenance and tolerance to low light conditions. However, there’s more than that–Several amazing Golden Pothos Plant Benefits, attested in recent research and studies, which makes it one of the most beneficial houseplants. 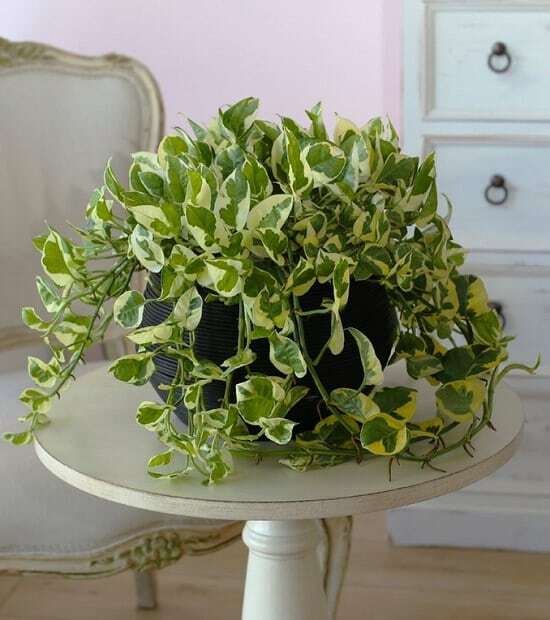 Pothos is a low maintenance houseplant that does well in a variety of conditions–both the sun and shade, moist and dry soil and a poor substrate. Although for best results locate it in bright indirect light and water only when the soil turns dry to the touch. In the case of low lighting conditions, it’ll become less variegated. Note: According to this study, golden pothos plant can survive drought. Propagating pothos is one of the easiest things as compared to other houseplants. All you need to do is take 6 to 12 inches of cutting and snip off the lower leaves. 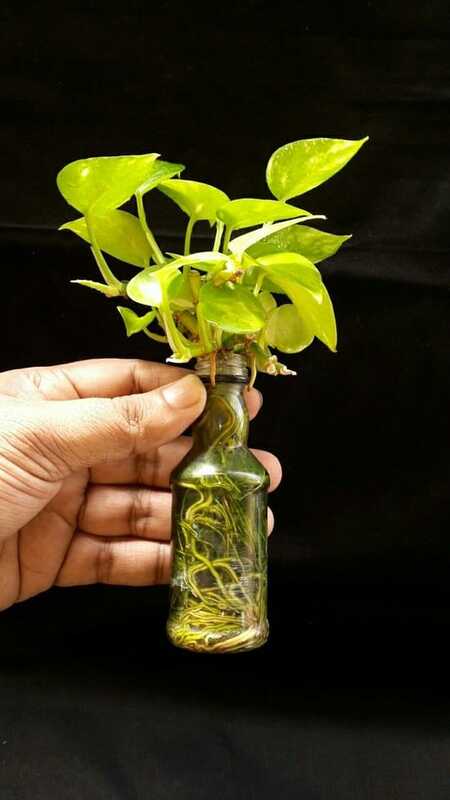 Place this cutting in clean water and change the water once in a week. Plant the pothos in a pot as soon as the roots start to emerge. 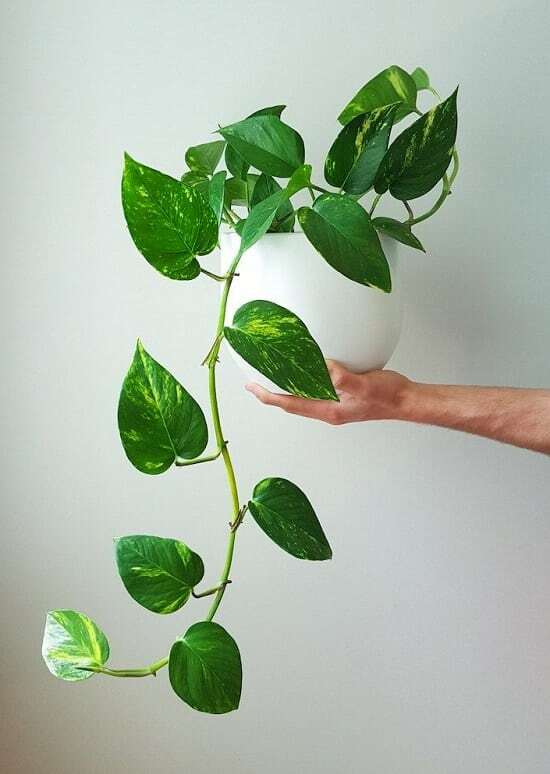 Pothos can grow without direct sunlight; it’s a forgiving houseplant that grows even in low lighting and drought like condition in cool temperature. These plants will show less variegation and slow growth but won’t die. Also, improver air circulation and air-conditioned offices don’t have much effect on this plant. Although the leaves are soft, the plant is tough! Learn more about such plants here. Note: Check out this Japanese study here, which confirms the air purifying capability of the pothos plant. The frequent exposure to benzene is from tobacco smoke, vehicle exhausts, gas stations, and industrial emissions. The seemingly harmless stuff such as paints, glues, detergents, and furniture wax also raise the benzene levels in the air in indoor space. Exposure to benzene causes damage to the cells in bone marrow, which can lead to anemia. Long term exposure to benzene weakens our immune system, making us more susceptible to various diseases and ailments. Check out this detailed article to know more about benzene and its effects on human health. Pressed wood products, carpets, cigarette smoke, and burning of appliances such as wood-burning stoves, kerosene heaters, and gas stoves without vents are the reason for formaldehyde exposure. Watery eyes, burning sensation in nose, eyes, throat can happen due to short term exposure. It can also lead to cancer and leukemia as stated by the National cancer institute. There are many other adverse effects of formaldehyde on human health, which are stated here in detail. In the indoor space, carbon monoxide levels rise mostly because of gas heaters, wood fires, clogged chimneys, blocked vents, some electrical appliances. The people who are at high risk are infants, unborn babies, and elders. Also, if you have a chronic disease, respiratory problems, or anemia, CO exposure can affect you more than a healthy person. Vomiting, headache, nausea, and dizziness are linked to the breathing of CO gas. The high CO levels in the surrounding air can even cause unconsciousness and death. Here is an educational article on the adverse effects of CO. Adhesives, gasoline, nail paint, varnishes or rubber cement, xylene is present in all many household and industrial items. It affects the central nervous system when inhaled and can cause vomiting, nausea, dizziness, and headache. As the consistent exposure increases the effects become more noticeable and lethal. To know more about the xylene exposure risk, see this educational article. The evaporation of toluene from materials such as paint thinners, paints, gasoline, and nail polish leads to its increases concentration in the indoor space. Toluene affects the central nervous system and causes headaches, dizziness, or unconsciousness if you are exposed to it for a short period. Long term exposure to toluene had serious effects which can lead to cognitive impairment, incoordination, and loss of vision and hearing. Know more about this toxic agent in this post. 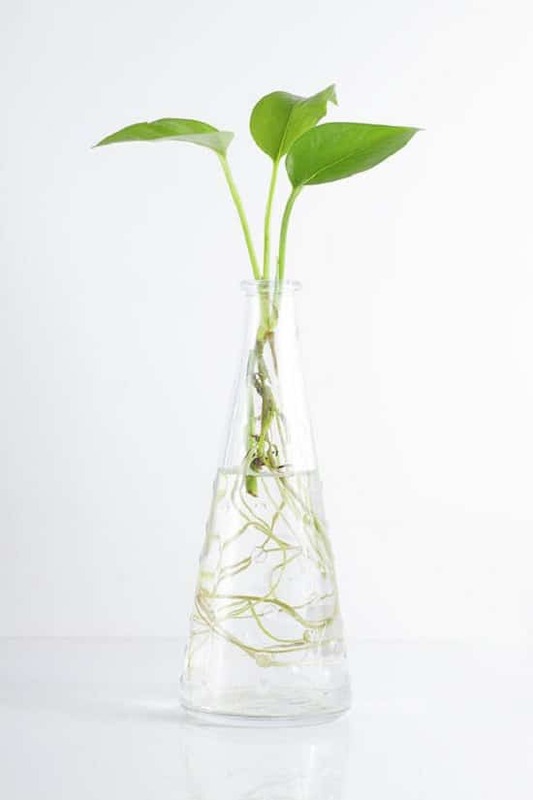 Pothos can remove formaldehyde and other VOCs effectively, an experiment was conducted recently by the support of NASA, learn more about that here. Humid air can protect you from cold and influenza as viruses can’t transmit easily in moist air, it also keeps your skin hydrated. Whereas, dry air multiplies the allergic reactions and dust & airborne pollutants. After knowing all these advantages of humid air, it’s good to know that pothos plant also increases humidity around it. 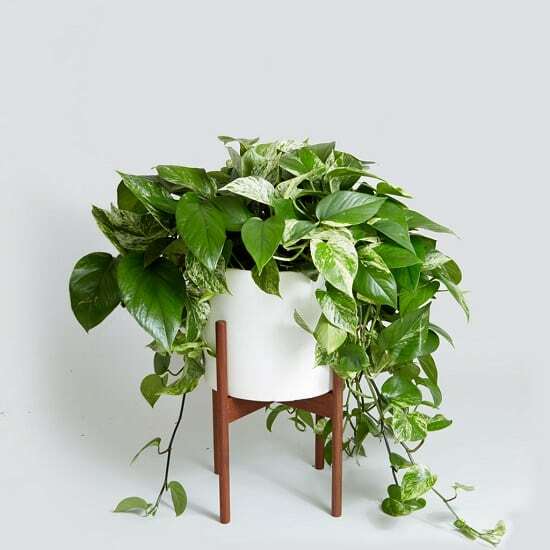 However, there’s no proper research to guide how many of these plants you need per room for this purpose, but the same NASA experiment also found out that golden pothos is one of the plants that increase humidity. This one is obvious! Pothos is a trailing plant that can be trained to grow on almost anything. The special feature of this houseplant is that you can have it as a trailing or climbing houseplant, whatever suits you. 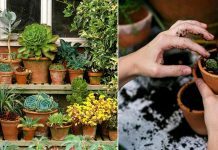 Plus, unlike other houseplants, it doesn’t become dull under lack of sunlight. 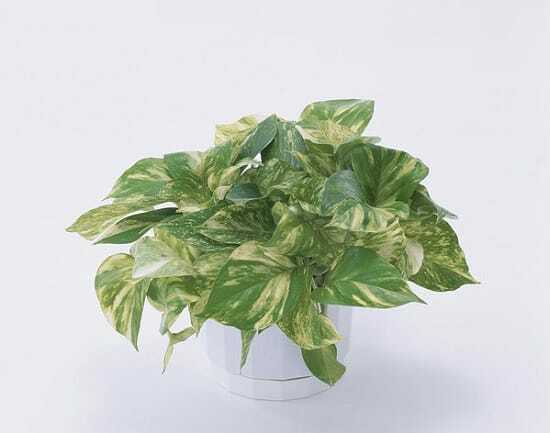 The variegated bright yellow and green leaves are heart-shaped and look attractive because of the waxy surface. We also added it in our list of heart-shaped indoor plants. 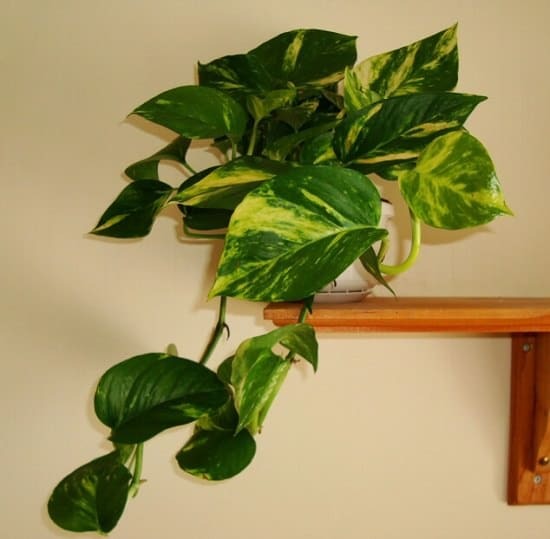 You can train pothos to grow in any desired way, making it a versatile plant for decorative purpose. Place it on a shelf, office desk, table, kitchen countertop or hang it from the window, stems cascading downwards. You can also train it in the form of a loop or any other shape. If you believe in the Feng Shui, then there are a multitude of golden pothos benefits according to it. Why? Because Feng Shui experts consider it as an energy force that cleanses the negative energy. It makes sense; after all, it does remove pollutants from the air. It is recommended to keep the pothos near WiFi, television, router, or computer. The potential benefits are reduced stress and improved sleep quality. Vastu principles believe that this plant brings good luck and positive energy in households. 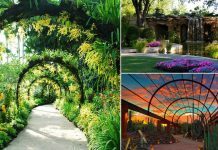 Although planting it in the garden is not recommended by Vastu followers. This humble houseplant has many uncommon names. One of them is Devil’s Ivy because it is hard to kill. Moreover, some people consider it a weed. Also, in many countries, it’s called Money Plant, due to the belief that growing it can make you richer and never let you be short of money. A study conducted on 14 Japanese men found out that touching the leaves of golden pothos has a calming and peaceful effect on the mind. You can check it out here. One of the best pothos plant health benefits is, it’s an efficient houseplant, when it comes to absorbing CO2, according to this Malaysian study. 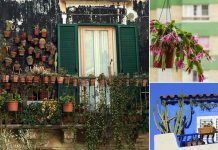 One research on three common houseplants–Snake plant, spider plant, and pothos, outlines that these plants could also absorb ozone, which is a common indoor air pollutant. Read this educative article to learn how ozone is harmful to you if it’s present in your home and the sources of its exposure. Previous article8 Onion Skin Uses You Wish To Knew Before!